Sonia has a great post about what happens when you try to close the sale. If you don't pay the salesforce (because you go direct, or you go free), then who is going to do that for you? The only answer that occurs to me is, "your users/fans/customers." This means that a critical element of any strategy that ditches the salesforce is to figure out how you will empower and encourage your customers to take their place. Easier said than done. 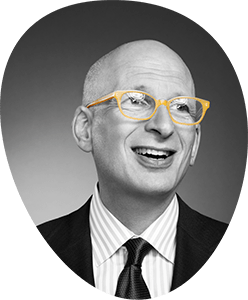 You can get alerts whenever this blog is updated by following @thisissethsblog on Twitter. Twitter is immersive. It washes over you. But what happens when a great link or clever post goes by? Squidoo just launched a promotion around the new TwttrList tool. The power of this tool is that it turns the momentary stream of tweets into a permanent sign post. A curated best of instead of a random time-based river. You can chronicle a conference, or highlight great posts about your brand or event. This lets other people find your collection of the best tweets on Google, or see a series of messages without the noise in between. Here are a few good ones. Give it a try. Maybe you'll win something. The smart guys at Contrast came by the office to talk about their thesis of abandoning conventions. It's the intent of changing what we expect when we use something. Obvious things like the design of a cell phone or subtle things like the design of a door knob. There are terrific benefits to successfully coming up with a solution that invents and leverages a new convention. Notice it. When you make a new way to do something, people are going to notice it. We'll notice it when the volume knob on the radio doesn't work the way all the other ones do, or when the navigation on your website isn't where it 'should' be. Is your creativity about the convention? For example, if you make a stereo that sounds better, it's not clear you should also change the way the volume control works. Noticing the shift in interface doesn't help sell your concept of better sound. Talk about it. Often, a new convention leads to conversations. People need to teach other about the ideas in your product or service, or complain about it or debate it. Again, no point changing the convention unless what you want is people to talk about your new convention. Protect it. Once the convention catches on, does the new way of doing things reinforce your position in the marketplace and lead to long-term benefits? Simple example: as a bestselling author, you could upend the convention that books cost money by publishing the first popular book-length ebook. For free. The new convention will be noticed. People will talk about it. They'll share the ebook because, after all, it's free. You can leverage this new convention by gaining attention, new readers, speaking gigs, etc. But can you protect it? Of course not. Now, everyone can make a free ebook, because your act of breaking convention showed them how. But that's okay, because as an innovator, the process was worth it. Compare this to Kai's Power Tools, which was a series of super powerful image editing software programs that came out a decade ago. The interface had all sorts of new conventions. The problem was the new conventions had nothing to do with editing images, didn't make the software work better, increased the learning curve and ultimately led to failure in the marketplace. If you've got talent, people want more of you. They ask you for this or that or the other thing. They ask nicely. They will benefit from the insight you can give them. The choice: You can dissipate your gift by making the people with the loudest requests temporarily happy, or you can change the world by saying 'no' often. You can say no with respect, you can say no promptly and you can say no with a lead to someone who might say yes. But just saying yes because you can't bear the short-term pain of saying no is not going to help you do the work.